For the most part, just about any beer I’ve had from Washington, D.C. the past couple of years has come from DC Brau. For one, they were the only one shipping outside of the district. And secondly, you just can’t go wrong with their products  they make a good beer. 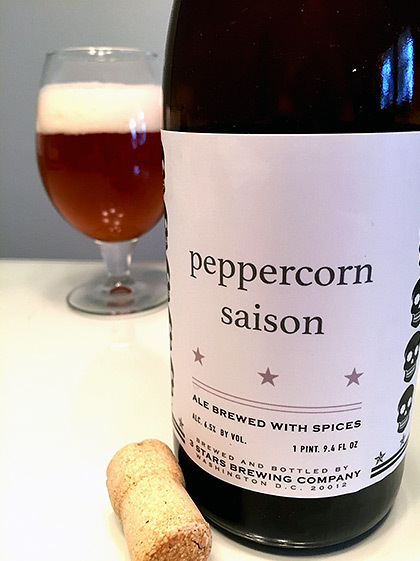 When I spied this bottle of Peppercorn Saison from 3 Stars Brewing, I was excited to see another option from D.C. and quickly purchased one  along with some other tasty treats. This 6.5% ABV saison would be my first introduction to the company. I think peppercorns make for a wonderful addition to this particular style  the ingredient has worked well as seen here and here. The problem with this particular brew isn’t the peppercorns. It’s the yeast  there’s a very strong, distinct banana flavor that probably shouldn’t be here. And it makes for a lackluster first impression. The beer pours amber in color with a creamy cap of white foam. For the most part, the beer smells great with hay, pepper, yeasty funk, grain and a soft banana trait mingling well. I’m not sure if this was intentional or not, but Peppercorn Saison tastes like a hefeweizen  only without the wheat. There is a ton of banana distracting from the grain, a distant peppery tingle and soft funky notes. There’s not much beyond the tingle for the peppercorn. The beer has an appropriately light body. The beer screams banana and I’m not sure why. The only thing missing from this beer to make it a Hefe is the wheat. I powered through the bottle, but as far as first introductions go, this one wasn’t the best. At least I didn’t have to pour it out like a bottle of the brewery’s Pandemic that I purchased after this one. 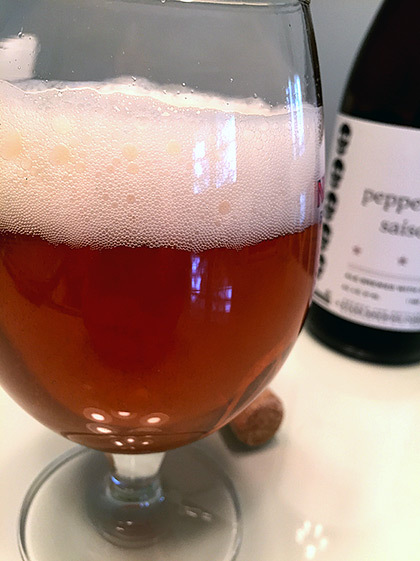 Share "3 Stars Brewing Peppercorn Saison"